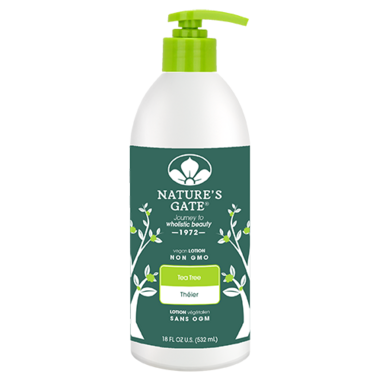 Nature's Gate Tea Tree Lotion softens skin with a gentle blend of Tea Tree Oil, Blue Cypress Oil, and Marshmallow. Nature’s Gate believes it’s not only essential what you put in your body but what you put on it as well. Apply liberally to body. Smooth into skin. Reapply to dry, rough chapped areas. For best results, use daily. FOR EXTERNAL USE ONLY. AVOID DIRECT CONTACT WITH EYES. Ingredients: Water (Eau), Caprylic/Capric Triglyceride, Glycerin, Cetyl Alcohol, Simmondsia Chinensis (Jojoba) Seed Oil, Gluconolactone, Stearyl Alcohol, Carthamus Tinctorius (Safflower/carthame) Seed Oil, Cetearyl Alcohol, Helianthus Annuus (Sunflower/tournesol) Seed Oil, Cetearyl Glucoside, Glyceryl Stearate SE, Xanthan Gum, Melaleuca Alternifolia (Tea Tree/théier) Leaf Oil, Butyrospermum Parkii (Shea/karité) Butter, Prunus Amygdalus Dulcis (Sweet Almond/amande douce) Oil, Prunus Armeniaca (Apricot/abricot) Kernel Oil, Argania Spinosa (Argan) Kernel Oil, Tocopherol, Vitis Vinifera (Grape/raisin) Seed Extract, Aloe Barbadensis Leaf Juice, Callitris Intratropica (Blue Cypress/cyprès bleu) Wood Oil, Humulus Lupulus (Hops/houblon) Extract, Althaea Officinalis (Marshmallow/guimauve) Root Extract, Salix Alba (Willow/saule) Bark Extract, Allantoin, Polysorbate 60, Benzyl Alcohol, Potassium Sorbate, Sodium Benzoate, Sodium Hydroxide, Fragrance (Parfum)*.